Telford's splendid stone bridge across the River Severn at Bewdley in north Worcestershire is probably the fourth to have been built here since 1447. The Grade I listed structure complements Bewdley's Georgian river frontage buildings. It has remained in continual use and now carries the B4190 road. The original 1447 bridge was of stone and timber. The Lancastrians destroyed it in 1459, during the Plantagenet conflicts known as the Wars of the Roses’ (1455-85). In 1460, a timber bridge was constructed and rebuilt in 1483. In 1644, it was repaired following the destruction of an arch during the Civil War (1642-51) and remained in place until spring 1795, when it was swept away in the great Severn flood. Thomas Telford (1757-1834) designed the masonry replacement for the timber bridge. Thanks to an unusually dry season, Telford's foreman of masons, John Simpson (1755-1815) of Shrewsbury, was able to build the bridge at great speed in the summer and autumn of 1798. Simpson was a loyal assistant to Telford on many of his projects. The segmental arch bridge has three river spans and voussoirs with deep V-joints. The central 18.3m span has a rise of 5.5m, flanked by spans of 15.85m each with rises of 5.1m. A pair of arches on each bank cross the towpath and, more importantly, provide outlets for floodwater. The inner arches have 2.8m spans and the outer 2.1m spans, with rises of around 1.1m. The two river piers are of ashlar masonry with cutwaters on up- and downstream faces. The sandstone for constructing the piers and abutments came from Arley Quarry (SO758816), about 7km north of Bewdley. The remainder of the bridge is built of green Shropshire gritstone. The bridge is 8.5m wide and has balustraded stone parapets 1.17m high and 380mm wide. Large stone blocks separate each section of balustrade, and the central parapet block has a small pediment. East of the bridge, the approach road runs parallel to the river for about 55.5m along a low viaduct consisting of a dozen 2.1m semicircular arches, surmounted by a cast iron balustrade. The road turns sharply westwards onto the bridge itself — an octagonal toll house was located on the north side of the roadway. In his 1838 writings, Life of Telford, Telford describes Simpson as an "eminent mason" and that the bridge "remains in a perfect state". He notes that the cost of the bridge was £9,264. 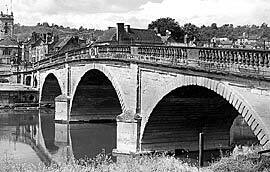 Herefordshire County Council assumed responsibility for the Bewdley Bridge in 1891, at which time the toll fees (presumably) were scrapped. In 1927, a 200mm thick reinforced concrete slab was laid over the entire length of the main structure, supported on sand fill over the crowns of the arches. The cost was £9,750. Major repairs were carried out in 1947-50, including refurbishing the parapets and cornices, installing new stone facing on the downstream spandrels and piers above cutwater level, and replacing defective stonework on the upstream face. In 1961, the toll house was removed. The present two-lane roadway is 5.5m wide with 1.14m footpaths on both sides. The stone abutments of the original bridge can be seen on both sides of the river (SO787753 and SO788754) south of Telford's bridge. In 2004, traces of the 15th century structure were uncovered during construction of flood defences along the river.